Newly elected Massachusetts senator Elizabeth Warren has a radical idea — words should mean what they mean. Take for example the word “filibuster.” Most of us have the quaint notion that a filibuster is a rarely used exhausting oration by a principled senator to stop devastatingly wrongheaded or corrupt legislation in its tracks. From the time of Cato, the legislative maneuver was used as the last gasp effort to do the right thing even as the forces of corruption were circling. It was essentially a plea for good men and women to think long and hard before passing ill-considered law. Think Jimmy Stewart in Mr. Smith Goes To Washington. But alas, in the Orwellian world of “government speak” the new filibuster means simply that a senator makes a telephone call to the senate majority leader threatening to stand before senate and protest a particular bill. Magically, the bill now requires 60 votes (for the cloture motion needed to end the phony filibuster) to pass instead of that old-fashioned formula for representative democracy — the favoring of one half of the members present plus one. No speech, no reason, no passion, and no democracy. It’s too damn easy to gum up the people’s business with that slimmest and slimiest of minorities — the ego of one. The rule has permitted the “Nattering Nabobs of No” — also known as Senate Republican Caucus — to use the filibuster 380 times since 2006 to stop such menacing bills as those appointing judges or heads of government agencies, ending subsidies to Big Oil, and to open government processes to the public. 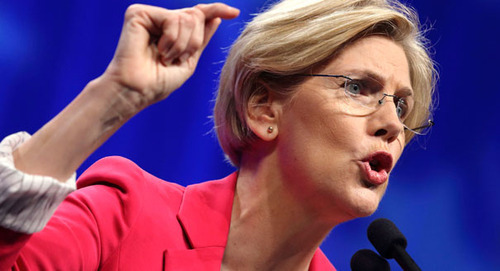 That, according to Warren, spells abuse and government gridlock. Oh, and what about that merit of allowing a sincere senator to try by the sheer force of his words to stop bad legislation from becoming law? According to Warren that’s as phony as the new filibuster, too. “We’ve seen filibusters of bills and nominations that ultimately passed with 90 or more votes,” she says. Senator-elect Warren has had enough of “government speak” and now calls for a majority to just be a majority. On her first week on the job in January, Elizabeth Warren, joined by several freshman senators, will propose that the Senate rules to be changed to make language meaningful again. She’ll ask that exclusive club, by a simple majority vote, to make a filibuster mean what the word implies. If she gets her way, senators will no longer hold a cell phone veto over the will of the majority and will have to actually stand in the well of the Senate to speak their piece. Maybe they’ll read aloud the Constitution, the Declaration of Independence or even the telephone directory. Maybe they’ll tell us about their childhood growing up in idyllic East Bumbletuck or about their favorite cat or about the time they caught the winning touchdown pass. But maybe –just maybe — they’ll feel compelled by logic or honor or just plain ol’ manners to explain to us all why the manifested will of the world’s greatest nation takes a back seat to their petty wants. Democracy in America: What Does it Mean? Yes, indeed we want that. Hate to say it but she completely failed. Bad news. She first gives a question that is so fuzzy that it becomes an invitation to come with politco-BS of the type usually made in introductory statements. She allows him to continue, instead of interrupting and re-stating a specific question and demanding an answer. The question as to “whether these bank practices are in keeping with receiving TARP funds”, gave exactly ZILCH in results, only more poliico-time to him. Hope she has done better on other occasions. This bodes ill. Perhaps she functions better in writing than in hearings—but earlier comments containing material praising her, has indicated otherwise as to the 25 billion bank settlement. Conclusion: 5 minute limits and non-responsiveness require better tactics. If she expected him to commit hari-kari and condemn the bank practices or make a general admission of their own failure, then that was a miscalculation. These hearing forms are for her useless, working as an expert. You can not do a dialogue in 5 minutes, and she is not authorized as a staff member to make political speechs such as Alan Grayson could do as a Rep.
Elizabeth Warren to Geithner: It’s called accountability!